I met Cathy Shill on an unseasonably warm, drizzly February morning when she picked up myself and three other out-of-town visitors in front of our hotels for a morning of wildlife spotting and snowshoeing in Jackson Hole, Wyo. Soon after tossing my Easton snowshoes into the back of the van, knocking the mud off my Muck Boots and climbing into the front seat, Shill, a naturalist and owner of the local trekking company Hole Hiking Experience, began educating us about the unique nature and history of the majestic valley that is Jackson Hole. Jackson Hole contains two main areas including the town of Jackson, a downtown area full of shops, restaurants, bars and residential neighborhoods, and Teton Village, the home base for Jackson Hole Mountain Resort, recently crowned the No.1 ski resort in North America by Ski Magazine. In-between these two hubs lay spacious privately-owned ranches and residences, all connected by the splendid Snake River. The valley also offers easy access to Yellowstone and Grand Teton National Parks, which is where we are headed today. During the 20-minute drive Shill explains that this northwest corner of Wyoming boasts one of the most precious and productive eco-systems in the world. As if on cue, Shill interrupts herself briefly to point out a pair of giant Trumpeter Swans taking flight. A few minutes later we spot a moose in the thicket just beyond the park entrance, and for a moment I feel like I’m on a Rocky Mountain safari instead of a snowshoe excursion. We pull up to the trailhead alongside a group of cross-country skiers. Hole Hiking Experience is one of the few tour companies permitted to use the land for commercial use, and with that permission comes a great deal of responsibility. Shill explains that national forests and parks were established for humans to enjoy nature and wildlife in an undisturbed state, and that it’s crucial to respect the rules and Leave No Trace policy in order to aid in preservation. At the most basic level, this means no trash, no disturbing flora or fauna and no domesticated animals. Right away we see a dog bouncing around in a snowy field near where the moose were still loitering. Shill calls out to the owner to warn him of the danger…although it’s unclear whether she’s more concerned about the safety of the dog or the moose. Cathy passed out fanny packs while we strapped into our snowshoes. Because it was nearly 40 degrees and literally raining in town when I woke up, I dressed light in a silky set of Watson’s mid-weight performance base layers, a micro-fleece pullover, waterproof outer layers, a hat, sunglasses and pair of waterproof Sorel boots. 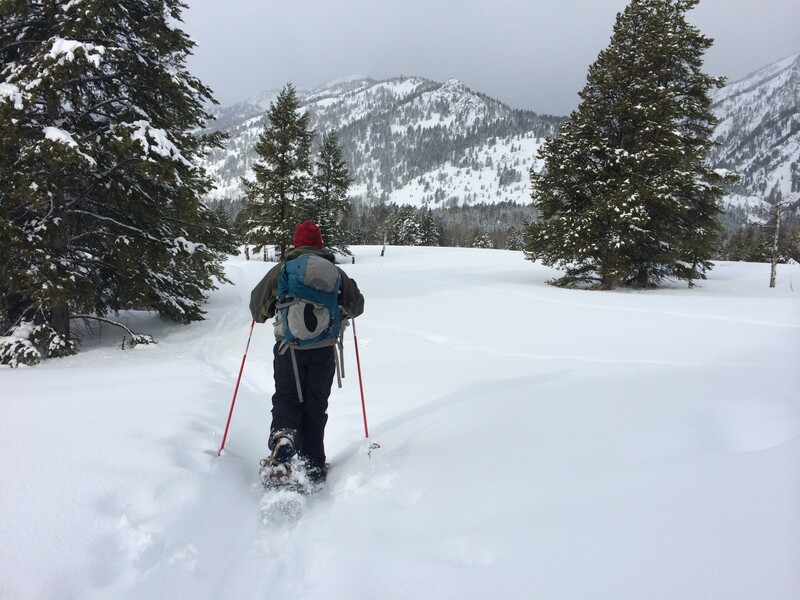 Over the past five days Jackson Hole had been blessed with almost 50 inches of fresh snow, which is a lot of powder in one week even for this winter wonderland, so I opted for a 30-inch pair of Easton Artica backcountry snowshoes. Because the snow was not only deep but also wet, the larger size and aerospace technology of Easton’s lightweight aluminum frame would be my best bet for optimal float in a snowpack that would be prone to sinking. I strapped in snugly and swiftly (thanks to Easton’s quick-cinch bindings) grabbed a pair of poles and snagged a position in line right behind Shill so I could absorb as much knowledge from her as possible. 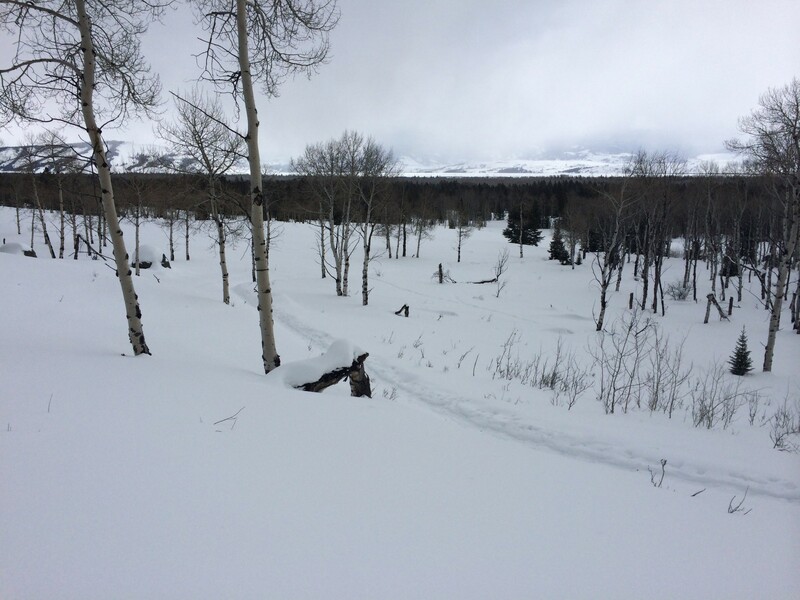 Due to the high avalanche danger and the varied experience levels of our group, we planned to take a simple, serene trail of mostly flat, forest terrain out-and-back in the Granite Canyon area. 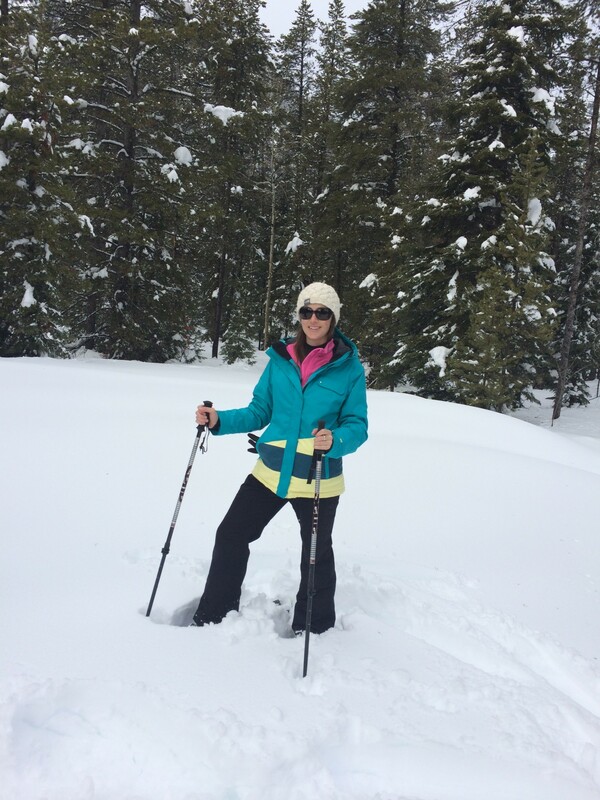 After several days of skiing the powdery steeps at Jackson Hole resort, I was happy to take it easy and enjoy the scenery while still getting some fresh air and exercise. We set off in the opposite direction of the skier’s route and immediately put my toe crampons to use conquering the massive, icy snowbank surrounding the parking lot. Once everyone made it up and over the steep, six-foot obstacle we settled into a steady pace on a nicely packed trail across a sparkling snow field. Just minutes after starting out, Shill gathered us around for a lesson in Tracking 101. We scrutinized a set of medium-size prints in the snow that seemed to scurry out from the trail a few yards, prance around, then scurry back to the trail a few feet ahead. Shill explained that because wild animals need to conserve energy, especially in the winter, they will always move in a straight line with a specific purpose. Thus, these tracks were most likely from a domesticated animal. Not too much further ahead we came across an example of what Shill meant by “moving with a purpose” in a set of tracks, probably coyote, that moved in a sharp diagonal line off the trail and into the woods. The size and depth of the two tracks were similar, as both were probably canine, however the trajectory of the two tracks were drastically different. The trail gradually sloped upward, hugging the tree line and, after taking a few too many icy-cold drops to the head, I had to pull my jacket hood up to prevent any more snow from dripping down my back. Although the mountains in the distance were barely visible, shrouded in a misty, white fog, the sun below was rapidly melting the snow off the trees and under our feet. I closed my eyes to let my other senses take over for a moment. 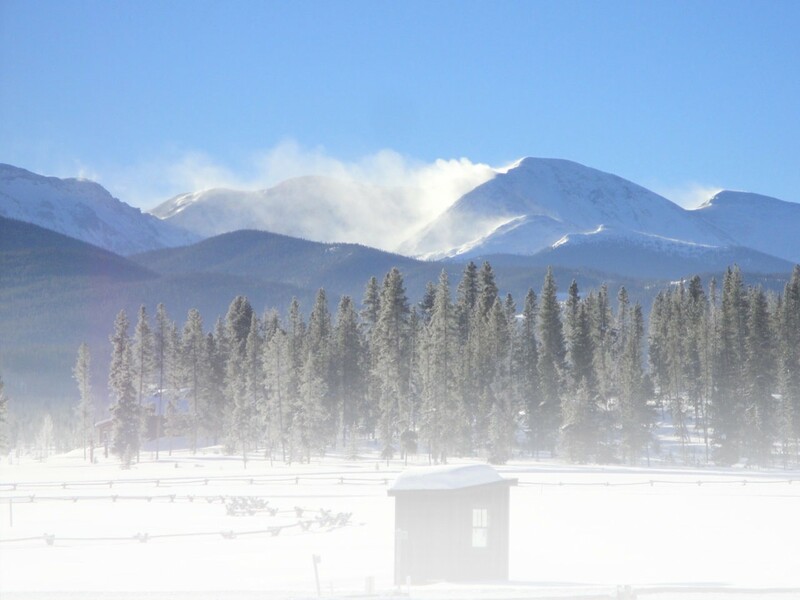 The still sound of winter was silent and soothing, and the heady scent of pine and citrus combined with the chill of fresh air gave me an invigorating rush of clarity and brightness that can only be obtained in the great outdoors. Ten minutes later we stopped for a sip of water, and Shill took the opportunity to introduce a lesson in trees. She used her pole to brush heavy snow off a branch of the nearest pine tree and, pulling a few needles off to pass around, she explained the difference in scents and shapes of the needles, as well as each tree’s significance in the evolution of the forest. I’m amazed at how true the circle of life really is, and that every wild thing has a purpose, including natural disasters such as wildfires and avalanches. Mother Nature knows what she’s doing, even if we don’t fully understand it. Halfway through the tour we took a break in a clearing to take some pictures and enjoy the snacks Cathy packed for us. 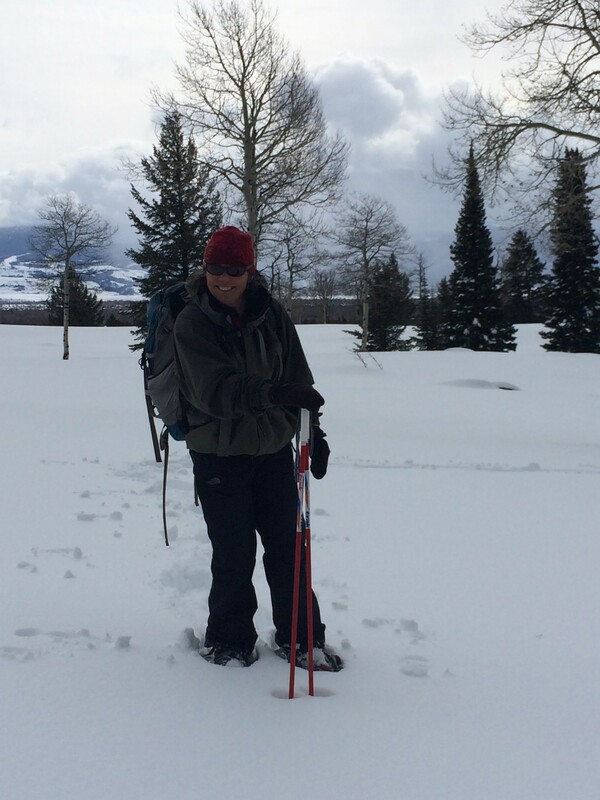 I chatted with the other people in our small group, an older couple from Tucson, Ariz. and a girl about my age from New York, and asked them why they had chosen to snowshoe today instead of skiing, snowmobiling or any other myriad of winter activities that Jackson Hole offers. Like myself, they all had participated in other activities on their trips and wanted a day of snowshoeing to give their joints, and their wallets, a break. 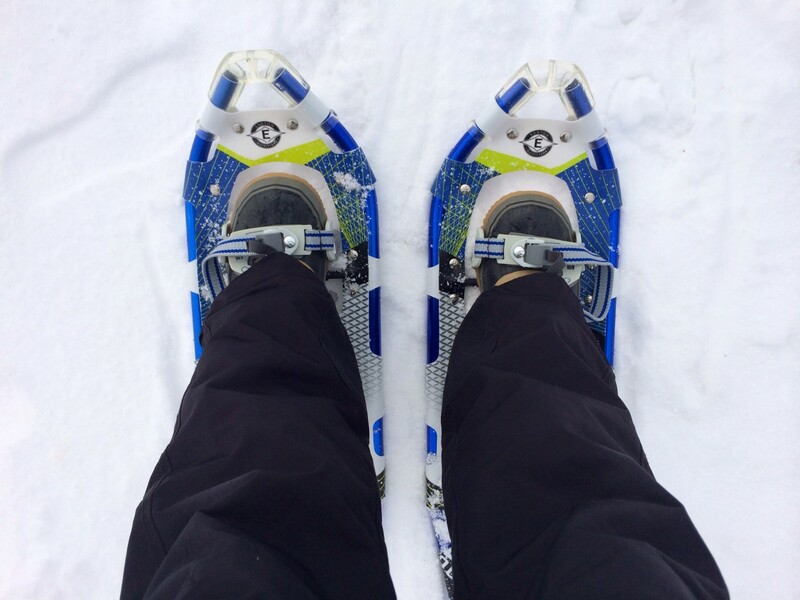 It is widely understood that if you can walk, you can snowshoe, even years after downhill skiing and other, more technical activities become too challenging. And although a guided tour with Hole Hiking Experience comes at a cost, it is certainly more affordable than purchasing a ski pass or renting a snowmobile. 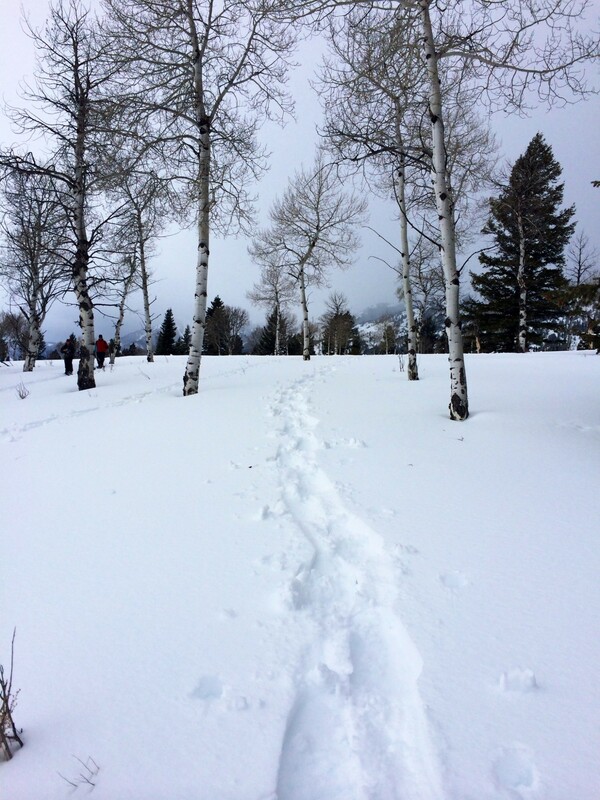 For me, snowshoeing offers great cross-training for skiing and an opportunity to get up close and personal with a part of Jackson Hole that I would have otherwise skipped during the winter months. On the way back we decide to challenge ourselves and trail-blaze our way across the pristine snow field we spotted on the way out. As I anticipated, the untracked snow was very deep and wet, but I had no problem floating across it except for having to exert a little more energy than before. We hiked up a hill and through a grove of naked aspen trees. I’m in awe at how this particular species can look so magnificent year-round, with leaves or without, and suddenly I’m having a personal conundrum trying to decide in which season I think the aspens are the most beautiful (stunning in autumn, perfectly shady in the summer, but probably the most striking in winter…). I finally come to the non-conclusion that they can all be my favorite and I don’t have to pick just one. Phew! “In every walk with nature one receives far more than he seeks,” she says. Everyone nods in agreement and takes a moment to reflect on the day and process this nugget of wisdom. As we near town the morning’s rain is turning back into light snowflakes, and it looks like the night will bring another dumping of celebrated white stuff, adding to the current precipitation measure of about 295 inches for the year. Shill continues to rattle off interesting factoids about Jackson’s phenomenal natural habitat as she drops us off. The couple from Tucson is simultaneously picked up by another company for a snowmobiling tour, and I’m headed to a local brewery to refuel. I thank Shill for sharing her wealth of knowledge with us and leave her with a promise to return soon for more lessons in the ways of the natural world. For more information on Jackson Hole Mountain Resort, visit http://www.jacksonhole.com. For more information on the Jackson Hole Chamber, visit http://www.jacksonholechamber.com. For more information on the Hole Hiking Experience, visit http://www.holehike.com. This entry was posted in Destinations, Features, Homepage Featured by Katie Hearsum. Bookmark the permalink. Enjoyed your column Katie, my son and some friends who are all mariners (work on oil rigs, boats, etc, graduated from Maine Maritime Acacademy and are Mainers themselves) are all spending the winter (when they are off from their jobs) in Jackson Hole, they took a road trip last winter and spent a few days there and fell in love with the place, so they are renting a place out there for the winter this year. I am going to forward your article to him, perhaps he will look up Cathy Shill and try one of the snowshoe treks. He loves the back country for snowboarding and his friend is the skier, and they both have snowsleds too. I am looking into trying some snowshoeing and we have no shortage of snow in Maine this year either.